JVC/Taiyo Yuden blank CD-R media has been the exclusive choice of professionals since recordable CD technology came to market. CMC Pro (Powered by TY Technology) CD-R media is manufactured to Taiyo Yuden's strict specifications and quality control standards, and is a perfect fit for professionals that require the lowest failure rate, highest playback compatibility, and superior printable surfaces. A uniform Shiny Silver Lacquer top coating allows for superior quality when silkscreened or thermal printed. CMC Pro blank media is compatible with almost every type of duplication equipment on the market. 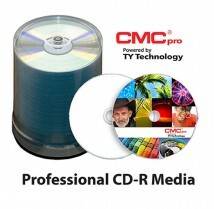 The integrity of your data is extremely important, so don't settle for anything less than the superior quality of CMC Pro Professional CD-R media. JVC/Taiyo Yuden blank CD-R media has been the exclusive choice of professionals since recordable CD technology came to market. CMC Pro (Powered by TY Technology) CD-R media is manufactured to Taiyo Yuden's strict specifications and quality control standards, and is a perfect fit for professionals that require the lowest failure rate, highest playback compatibility, and superior printable surfaces. A specially-formulated inkjet printable top coating allows for incredibly crisp, high-resolution prints and vivid, rich colors. Don't settle for dull or faded prints, use CMC Pro inkjet media and see the difference for yourself. CMC Pro blank media is compatible with almost every type of duplication equipment on the market. The integrity of your data is extremely important, so don't settle for anything less than the superior quality of CMC Pro Professional CD-R media. JVC/Taiyo Yuden blank CD-R media has been the exclusive choice of professionals since recordable CD technology came to market. CMC Pro (Powered by TY Technology) CD-R media is manufactured to Taiyo Yuden's strict specifications and quality control standards. A perfect fit for professionals that require the lowest failure rate, highest playback compatibility, and superior printable surfaces. A specially-formulated High Gloss inkjet printable top coating allows for incredibly crisp, high-resolution prints and vivid, rich colors. Unlike standard inkjet printable media, the glossy finish really makes your graphics POP! Don't settle for dull or faded prints, use CMC Pro High Gloss inkjet media and see the difference for yourself. CMC Pro blank media is compatible with almost every type of duplication equipment on the market. The integrity of your data is extremely important, so don't settle for anything less than the superior quality of CMC Pro Professional CD-R media. JVC/Taiyo Yuden blank CD-R media has been the exclusive choice of professionals since recordable CD technology came to market. CMC Pro (Powered by TY Technology) CD-R media is manufactured to Taiyo Yuden's strict specifications and quality control standards, and is a perfect fit for professionals that require the lowest failure rate, highest playback compatibility, and superior printable surfaces. Unlike normal inkjet discs, WaterShield is extremely water resistant, scratch resistant, and features a high-gloss finish. WaterShield blank media is the best way to ensure your discs stay protected from harsh everyday elements. Along with added durability, the high gloss finish produces an incredibly vivid print. WaterShield CD-R media is available in both a white and silver surface. CMC Pro blank media is compatible with almost every type of duplication equipment on the market. The integrity of your data is extremely important, so don't settle for anything less than the superior quality of CMC Pro Professional CD-R media. JVC/Taiyo Yuden blank CD-R media has been the exclusive choice of professionals since recordable CD technology came to market. CMC Pro (Powered by TY Technology) CD-R media is manufactured to Taiyo Yuden's strict specifications and quality control standards, and is a perfect fit for professionals that require the lowest failure rate, highest playback compatibility, and superior printable surfaces. Unlike normal inkjet discs, Print Plus is extremely water resistant, scratch resistant, and has a white matte finish. Print Plus blank media is the best way to ensure your discs stay protected from harsh everyday elements. CMC Pro blank media is compatible with almost every type of duplication equipment on the market. The integrity of your data is extremely important, so don't settle for anything less than the superior quality of CMC Pro Professional CD-R media. JVC/Taiyo Yuden blank CD-R media has been the exclusive choice of professionals since recordable CD technology came to market. CMC Pro (Powered by TY Technology) CD-R media is manufactured to Taiyo Yuden's strict specifications and quality control standards, and is a perfect fit for professionals that require the lowest failure rate, highest playback compatibility, and superior printable surfaces. Get the most out of your Thermal Printer with CMC Pro Thermal printable media. The printable surfaces are specially-formulated to work with high-end thermal printers, consistently accept the printed image, and minimize peeling or tearing. CMC Pro Thermal media meets the extremely high expectations of the professional Thermal Transfer printer user. CMC Pro blank media is compatible with almost every type of duplication equipment on the market. The integrity of your data is extremely important, so don't settle for anything less than the superior quality of CMC Pro Professional CD-R media. JVC/Taiyo Yuden blank CD-R media has been the exclusive choice of professionals since recordable CD technology came to market. CMC Pro (Powered by TY Technology) CD-R media is manufactured to Taiyo Yuden's strict specifications and quality control standards. A perfect fit for professionals that require the lowest failure rate, highest playback compatibility, and superior printable surfaces. Get the most out of your Thermal Printer with CMC Pro Thermal printable media. The printable surfaces are specially-formulated to work with Prism thermal printers for a sharp, consistent print. CMC Pro Prism Thermal media meets the extremely high expectations of the professional Thermal Transfer printer user. CMC Pro blank media is compatible with almost every type of duplication equipment on the market. The integrity of your data is extremely important, so don't settle for anything less than the superior quality of CMC Pro Professional CD-R media. This page was updated Monday, April 25, 2016 at 2:53pm by Microboards Marketing Department.